It was not an easy transition. It is never easy. But it was necessary. Like many other Americans, I am struck with disbelief over the new executive order by President Trump restricting Muslim refugees. I have a personal reason to be outraged. I am a Muslim refugee myself. I was born in Pakistan and raised by devout Muslim parents. In 1974 and 1984, through a constitutional amendment and presidential ordinance respectively, members of my Islamic sect ― the Ahmadiyya Muslim Community ― were declared heretics and denied their basic religious freedoms. Thousands of Ahmadi Muslims ― including three of my own uncles ― were jailed across the country for “crimes” such as reading the Quran or identifying as Muslim. Numerous Ahmadiyya Mosques and businesses have been burned down since, and hundreds of Ahmadi Muslims killed by extremist mobs. Ahmadi Muslim physicians were specifically targeted and at least three were gunned down while I was in medical school in Lahore, Pakistan. As if my faith alone wasn’t enough, the fact that I have always been a vocal critic of religious fanaticism made me a favorite target of the extremists. To seek peace and security, I had to move out of Pakistan. Towards the end of 2008, I came to the United States, sought asylum, and adopted America as my new home. It was not an easy transition. It is never easy. But it was necessary. After so many years, I finally knew what it felt like to enjoy security and religious freedom, and to be able to exercise my right to free speech. I was no longer a prisoner of conscience. And so began my new life as a refugee half way across the world. I have since took upon myself to champion the cause of universal freedom of conscience — specifically in parts of the “Muslim world.” I have written extensively, condemning religious extremism and promoting peace, tolerance and interfaith coexistence. I have also made sure that I remain an active member of the community wherever I live. When an extremist from my home country tried to bomb Times Square in 2010, I was completing my medical residency in New Jersey. The Ahmadiyya Muslim Community USA immediately responded to the act of terror ― and the ensuing fear and suspicion of Muslims ― by launching a national “Muslims for Peace” campaign. As the local president of the Ahmadiyya Muslim Youth Association North Jersey, I rallied young Muslims and hit the streets across Northern New Jersey, distributing hundreds of thousands of fliers condemning terrorism and getting the message across that Muslims ― like other Americans ― stand for peace. After the failed Times Square bombing, distributing ‘Muslims for Peace’ fliers in downtown Newark, NJ. 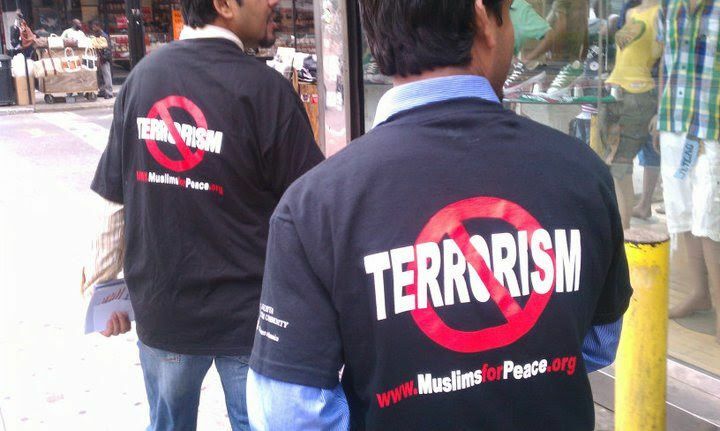 Then in 2011, on the 10th anniversary of 9/11, we launched the “Muslims for Life” campaign. The aim of this initiative was to commemorate 9/11 victims and to honor their memories by shedding blood ― our own. As an organizer, I set up tens of blood drives with keen participation from members of the Muslim ― and non-Muslim ― communities. Every year since then, the campaign has helped gather enough blood to save over 30,000 American lives. The same year, I was honored to be one of several activists to receive the Presidential Service award conferred by President Obama for community service. 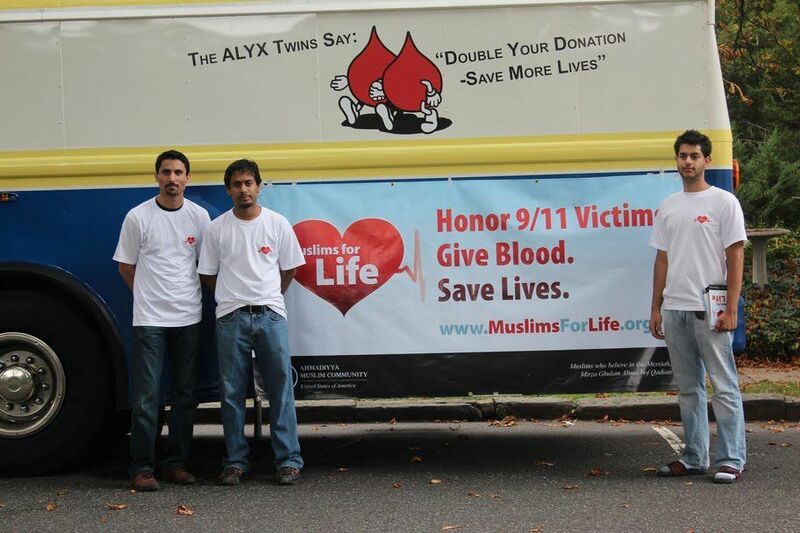 With Muslim youth in front of a blood mobile at one of many blood drives across the country. In 2013, I moved to Boston to pursue a fellowship in cardiology. Here, the Muslim community doubled its blood donation efforts. The “Muslims for Life” campaign was expanded to also include special blood drives to remember the victims of the Boston Marathon bombings.